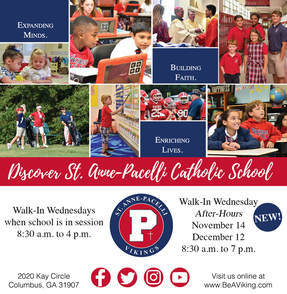 Located in Columbus, Georgia, St. Anne-Pacelli is the only Catholic, preschool through 12th grade, college preparatory school serving the southwestern portion of our state. Our school's comprehensive college preparatory curriculum and outstanding faculty are the centerpieces of a school-wide experience designed to change minds for good. Parent involvement is a critical component when it comes to the success of students. At St. Anne-Pacelli, there are many ways for parents to get involved and stay informed. St. Anne-Pacelli Catholic School conducts year-round admissions. Applications for 2018-2019 and 2019-2020 are now being accepted. Learn more about St. Anne-Pacelli Catholic School - a place of opportunity - in these videos or in The Yawp, the annual magazine of St. Anne-Pacelli Catholic School. Come see our school for yourself during Walk-In Wednesday from 8:30 a.m. until 4 p.m. every Wednesday school is in session. We're also offering Walk-In Wednesday After-Hours from 8:30 a.m. until 7 p.m. on December 12. Don't miss Admissions Day, scheduled for January 12, 2019. St. Anne-Pacelli Catholic School is a winner in the Favorite Private School category of the Ledger-Enquirer’s Readers’ Choice Best of 2018 Awards, and St. Anne-Pacelli Catholic School President and High School Principal Ms. Ronie Collins is a winner in the Favorite School Principal category. Thank you so much for voting for us! In November, we're collecting toothbrushes for St. Anne Community Outreach. Meet our November 2018 Viking of the Month recipients. The St. Anne-Pacelli Home & School Association’s annual Breakfast with Santa is Sat., Dec. 1 in Visitation Hall. Reservations are $8/person for kids ages 4 & up and adults. Children 3 & under are free but do require a reservation with an adult to attend. A limited number of seats are available! Reserve your seat online by Tue., Nov. 27. St. Anne-Pacelli Catholic School will have a Lovelight Christmas Tree Lighting Ceremony on Thursday, December 6 at 12:05 p.m. in our Mother of Mercy Courtyard as a way to celebrate those named on the Lovelight Tree. Our Lovelight Christmas Tree will stand in the Mother of Mercy Courtyard during the Advent Season. If you would like to purchase a white light or a beautiful angel in honor or memory of someone that you love, please complete this form and return it to the school's main office. Your donation will benefit St. Anne-Pacelli Catholic School, and your loved one will be remembered daily in our prayers. A list of honorees and memorials will be posted in Viking Hall of the high school and notifications of your Lovelight gifts will be sent by mail. Please include addresses for notifications. May your holidays be filled with joy, God’s blessings, and all good things! The 14th Annual Deimel Legacy Ball will be held Saturday, January 26, 2019 beginning at 6 p.m. at the National Infantry Museum. The black tie optional event, which celebrates the Catholic faith,is sponsored by parishes in the Columbus Deanery of the Diocese of Savannah and will be hosted by Diocese of Savannah Bishop Most Reverend Gregory J. Hartmayer, OFM Conv. Proceeds from the Deimel Legacy Ball support tuition assistance at St. Anne-Pacelli Catholic School. The evening will feature cocktails, dinner, and dancing. Reservations are on sale online and are $75 per person until November 13. Reservations will then cost $100 per person from November 14-December 31 and $125 per person from January 1-18. Learn more about a $7 million capital campaign to make major enhancements to St. Anne Catholic Church and St. Anne-Pacelli Catholic School. Please consider making a pledge today! School office hours are Monday-Friday from 7:30 a.m. until 4 p.m. In 2018-19, St. Anne-Pacelli Catholic School students in PK3-12th grades will attend school Monday-Friday from 8 a.m. until 3 p.m. each day, with the exception of some Noon dismissals as noted on our school calendar. Before & after-school care is available to students in PK3-8th grades. Learn more.